Busy Irish pub serving drinks in plastic glasses for the masses of football fans. The bar is central to it all, with pretty much standing room only around. But there was slightly more space at the rear. Beyond the toilets was an outdoor patio with plenty of space and a few smokers. Championship football was showing on multiple TVs. Bombardier was the only ale on. 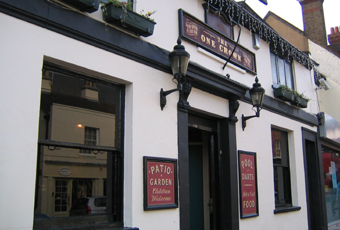 Very basic pub with little character and little to recommend it. Very old pub which would be better if it stocked a well-kept real ale. Only Bombardier was available and I'm afraid it was a rather mediocre pint. Nevertheless the barmaid was very friendly and chatty, and the clientele was a distinct cut above the lot just up the road at The One Bell. Watford is a a desert when it comes to decent pubs, but this is one of the better ones. Just sort your beer out. I used to visit a couple of years ago and they did a good selection of 3 rotating ales. Seems now only to be one and not stored well. Typical old boozer with pub grub but I only stayed for one last time and don't fancy another visit. I suggest - give it a try yourself to see if I had bad experience but not for me.